If you are not familiar with The Great British Bake Off, stop reading and go watch it immediately. Like right now. You’ve got 3 seasons and one rainy memorial day, what could be better. One of my favorite things are the weird british recipes that we just dont have here. Like meat pies. Which I have to be honest sounded pretty gross to me but a google search and a link to Paul Hollywoods recipe on an evening home alone with a lot of leftover steak in the fridge changed my mind. I actually made myself a little sick eating so much of this. 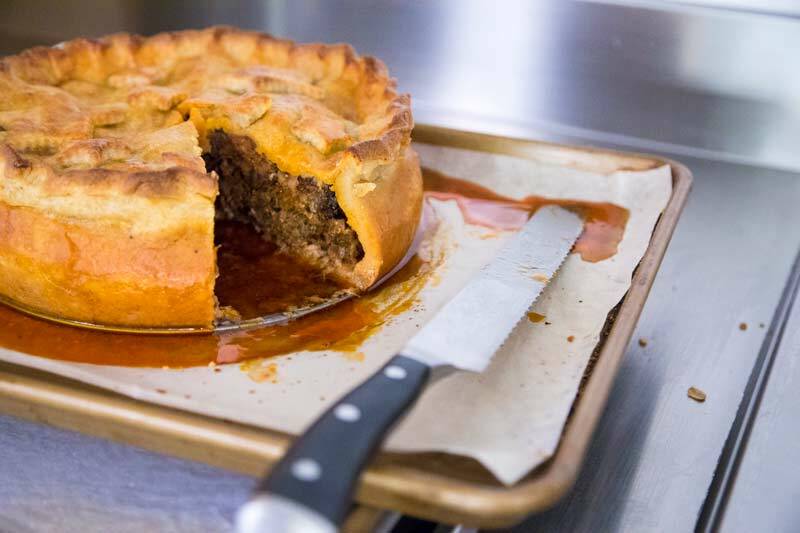 If you have some leftover steak or other meats, maybe some uncooked ground beef because your bbq got rained out, meat pie is your answer. I suggest going into this recipe with a spirit of adventure – this one is more about the process and journey than the result. 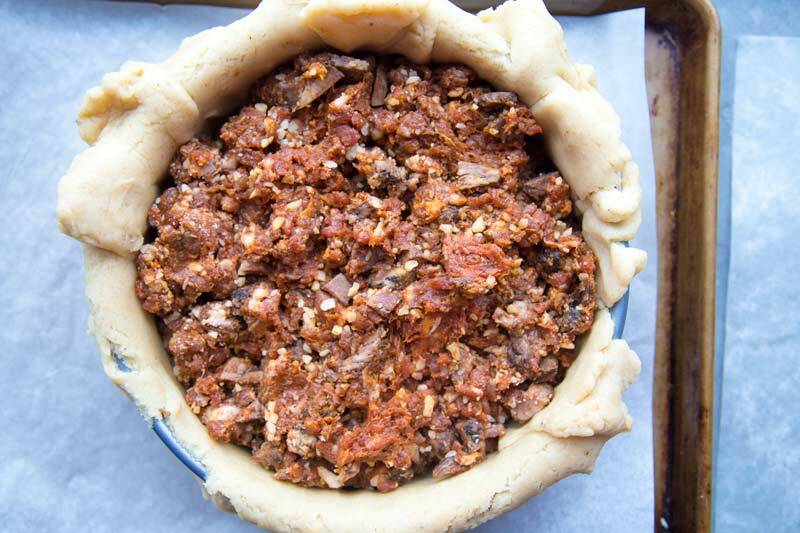 Its a rainy day meat pie adventure. Party on. Preheat the oven to 350˚F and grease a 9" spring-form pan (if you only have na 8 or 10 inch pan thats fine just remember that it will be a thicker or thinner pie so adjust the cook time accordingly). 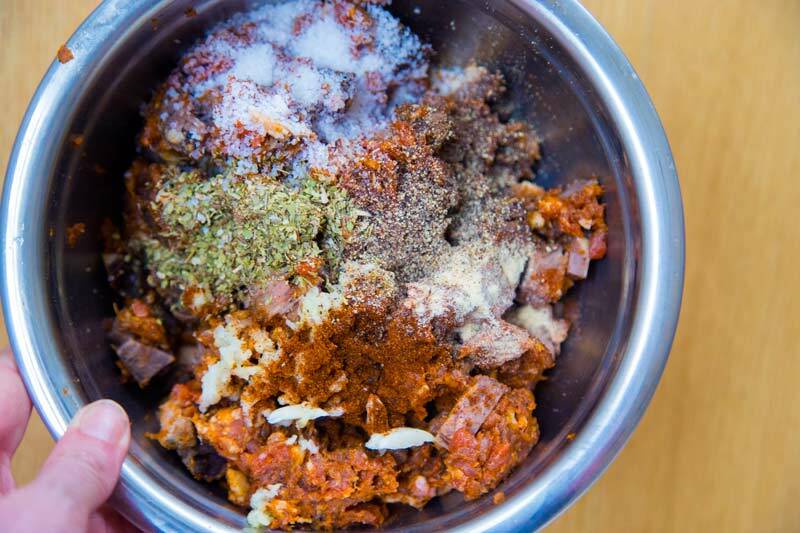 To make the filling put all of the ingredients in a large bowl and use your hands to mix it all together, being thorough but not over working it (think tossing a salad not making a snowball). 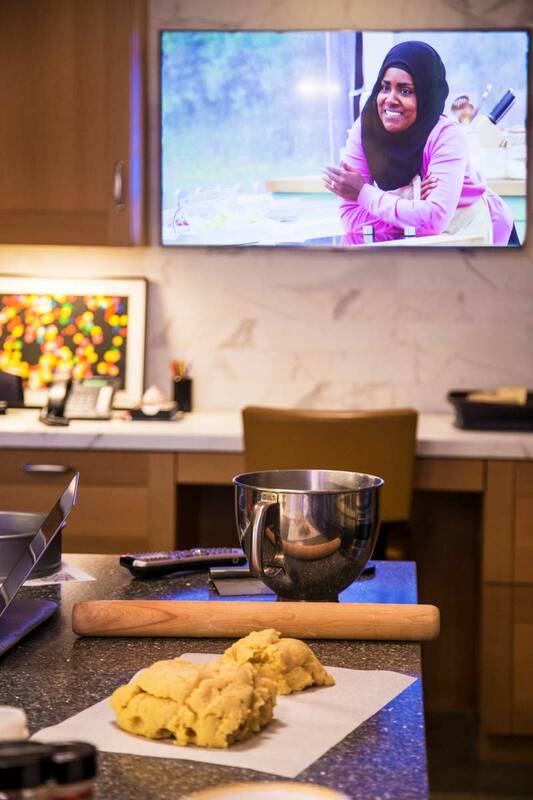 For the hot water crust pastry, combine the flours and cold cubed butter in the bowl of an electric mixer. Mix on low speed until the butter is about pea-sized. In a small saucepan heat the water, remaining 4 oz of butter and kosher salt and bring just to a boil. Remove from the heat and slowly add it to the flour with the mixer on low. 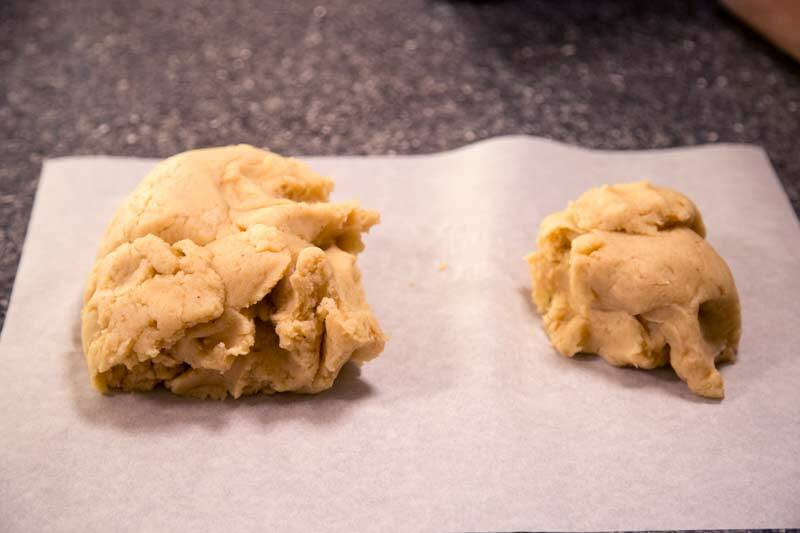 Mix until the dough comes together into a ball (30sec - 1 minute). 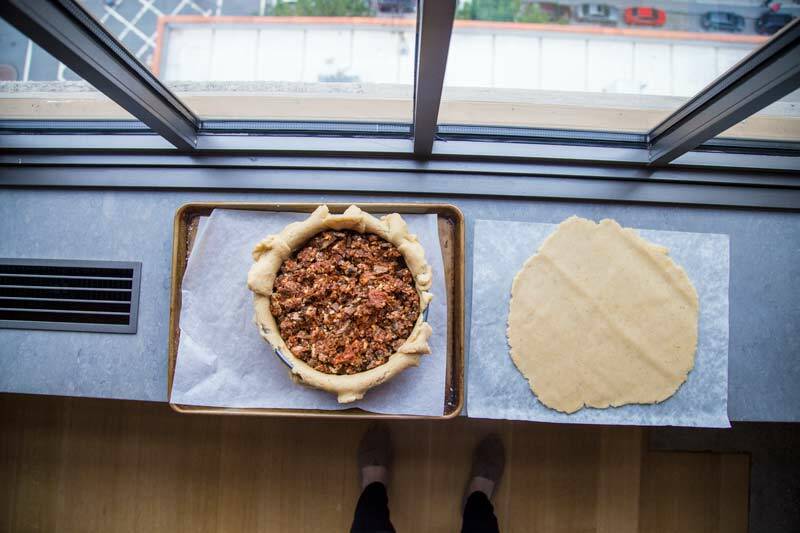 Work rather quickly while the dough is warm and pliable, eyeball about ½ of the dough and set it aside. Roll out the remaining ⅔ piece to about ¼ inch and carefully transfer it into the springform pan and press it into the corners, creating as even a lining as possible, leaving a little overhang at the top - if it rips or breaks off around the top don't worry, a gentle pinch will patch things up. I recommend blind baking the bottom even though the original recipe does not do this (so this is an optional step) - prick the pastry a few times with a fork and bake for 20 minutes. While this bakes, roll out the remaining ⅓ of the dough again to about ¼ inch thick - i did this on a piece of parchment which makes it a little easier to transfer but a little harder to roll - either way we can use decorative cutouts to hide all imperfections. Spoon the filling into the pastry-lined tin. Press it down and level the surface. 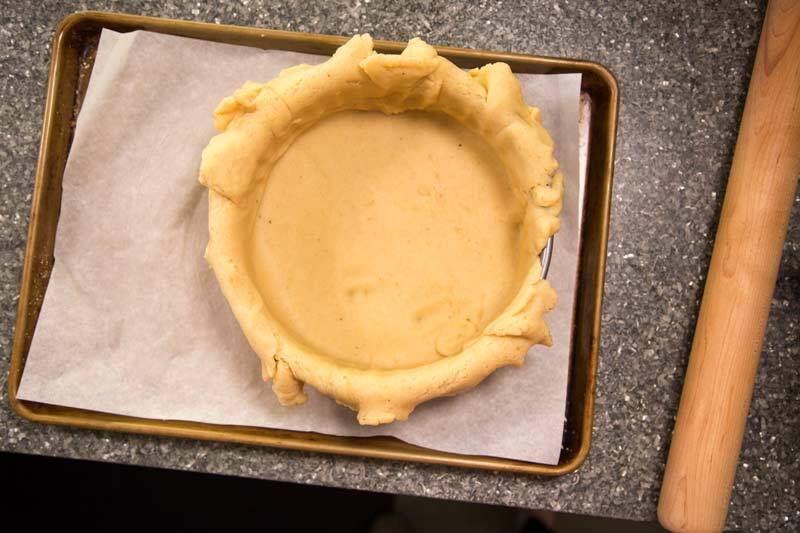 Brush the pastry edge with beaten egg yolk and place the pastry lid on top. 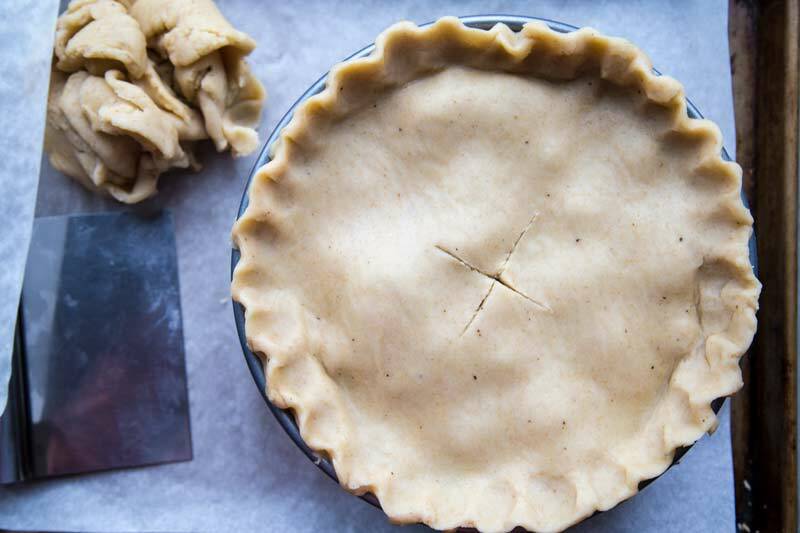 Crimp the edges to seal and trim off the excess pastry neatly. Brush the top with more egg yolk. Make a hole in the middle of the lid for steam. If you want some decorations, re roll any scraps and use a cookie cutter to cut out shapes. 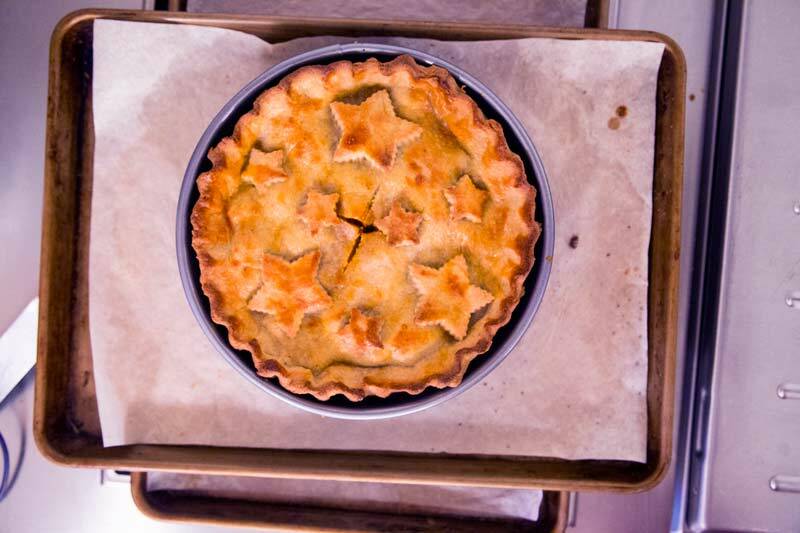 Brush the top of the pie with the egg wash and place shapes on top, brush them with the wash as well. Place on a baking sheet bake the pie for 30 minutes. Turn the oven down to 325˚F and bake for another hour before starting to test the temperature - when it hits 160˚F take it out and let cool 30 minutes or more before slicing. This is usually served at room temp.